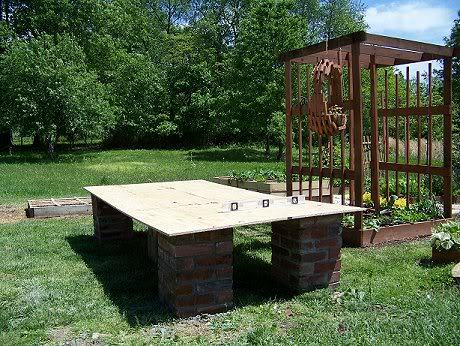 Here is some photos of the 4 x 8 raised garden, that has a plywood bottom, and sits on legs I made from bricks. 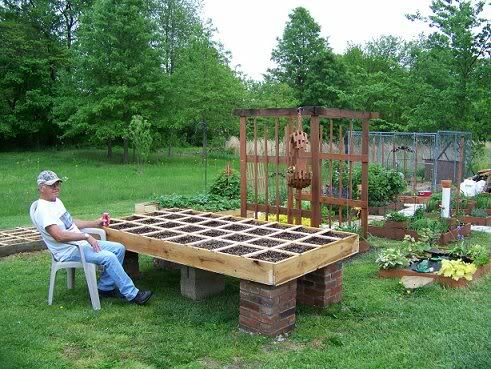 You could use cement blocks that would work just as good. 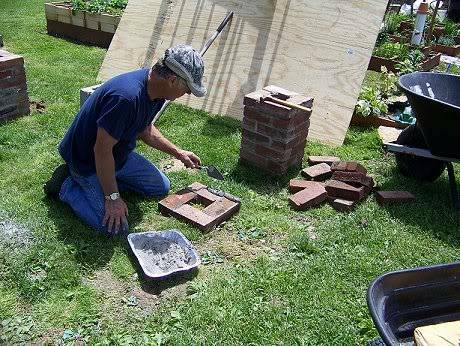 Making the brick legs was not hard, I just mixed a little mortar mix in a pan, think of icing a cake (not that I've ever iced a cake before, but that's what my wife said) this spring I'll try to get a video of how to do it, you will be surprised at how easy it is. 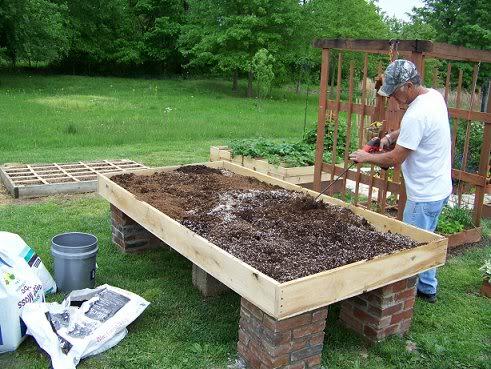 Whatever you make your legs from, they will need to have the strength to support the garden that will be very heavy counting the weight of the wood and the soil mix once it is wet. I suggest you avoid wooden legs. Cement blocks work well, and support the center if making a 4 x 8. 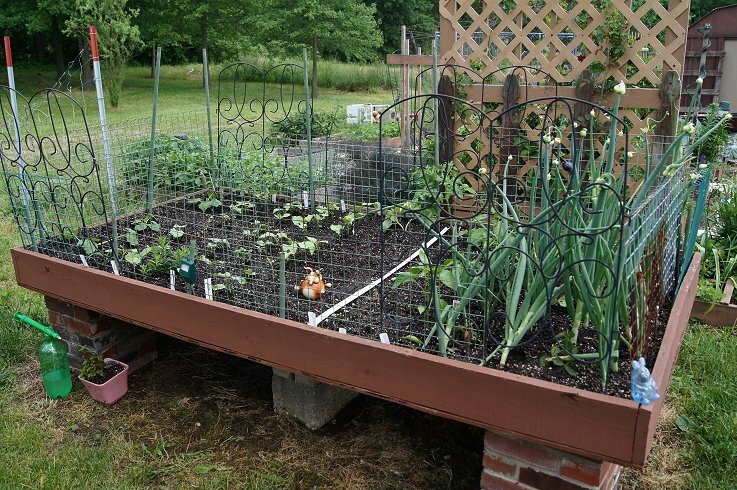 Whatever you use you want it to be sturdy enough the garden will not turn over. 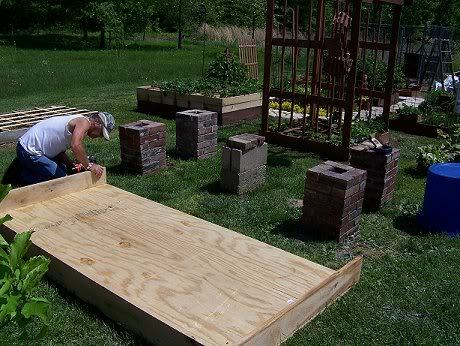 Once the legs were made and dried, I took my plywood and made sure everything was level. I used just cement blocks for the center support. I added the end pieces, I used screws. I added the side pieces, and it's starting to look like a garden! I drilled holes for drainage, one per square foot, and one in each corner. Time to sit back and take a break! This will be it's third year, and I see no signs of deterioration of the plywood bottom. We have had excellent results growing in it. Love, Love, LOVE the TT garden! Actually, I Love y'all's ENTIRE garden! So impressive! DH and I are planning on doing a mix of ground and TT's. 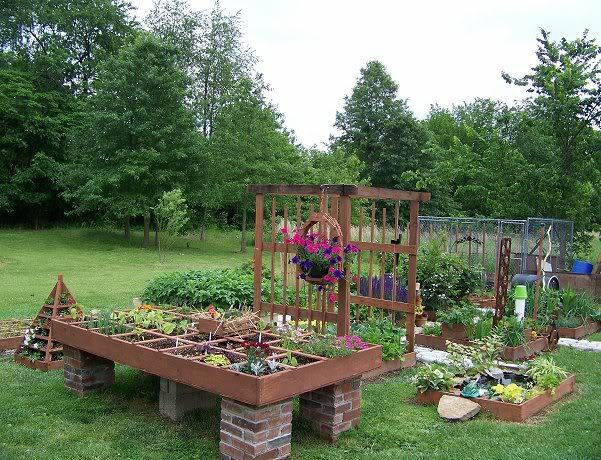 Everytime I talk about what I want mine to look like, I show DH pictures of the garden you have all created! The TT is awesome and I also adore the arbor bed! And the bed with the walkway around it! 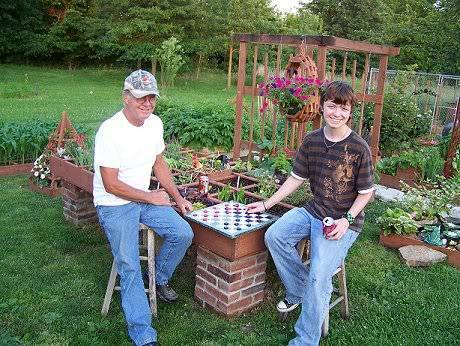 I have to give Bob all the credit for the building of all the different gardens, with Josh's help of course. 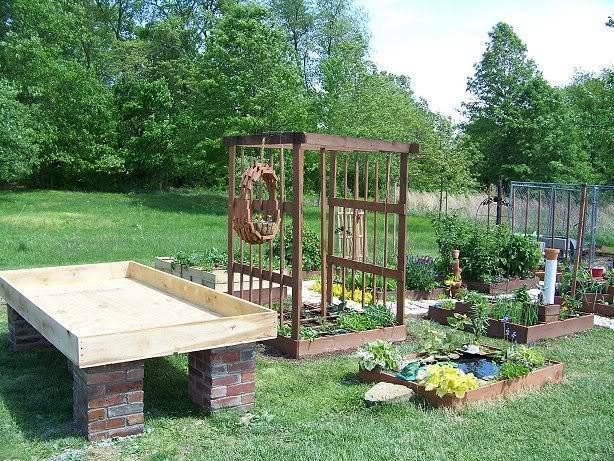 I have to say the raised garden is my favorite one. It's so nice to have a garden you can just walk up to, with no bending over! 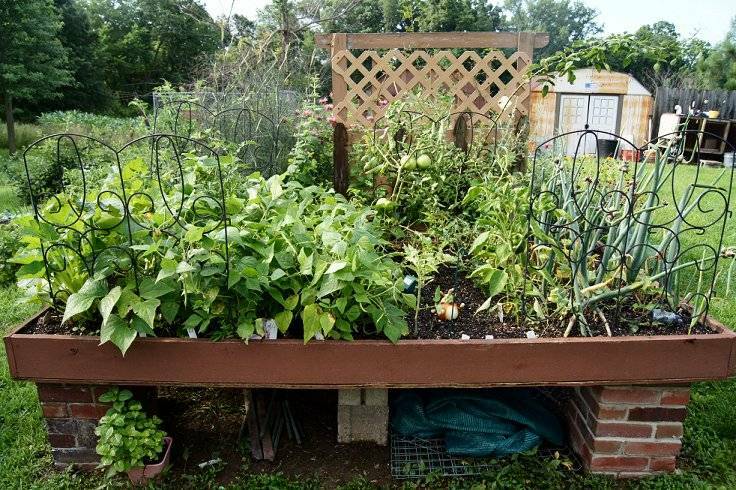 I was unsure if it would produce like the other gardens on the ground, but it does. So the table garden is doing great this year. I put a little fence around it to keep the cats out. 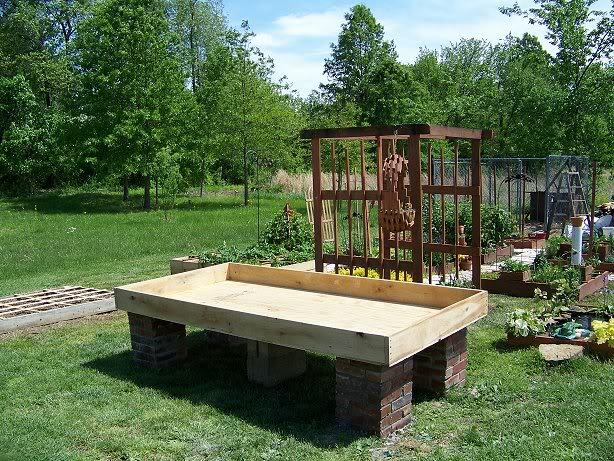 The Table Top raised garden is doing great too. The bush green beans are doing great and we are getting a lot of them now. The zucchinis are doing great also and there are some pretty nice looking tomatoes on the tomato plant, still green yet but looking good! The Egyptian walking onions are ready to walk and we have been getting several bell peppers.